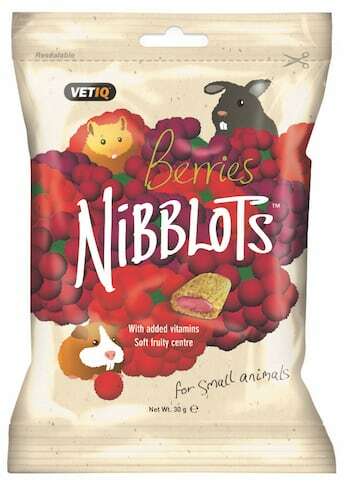 VetIQ Nibblots For Small Animals – Berries VetIQ Nibblots have been formulated to maintain your small animal’s wellbeing. They comprise of a crispy cereal shell with a soft fruity centre which contains a source of Omega 3 and vitamins to help promote a healthy skin and coat and can help to create bonding between pet and owner. Directions for Use: Ensure fresh drinking water is always available for your pet. Small animals should be supervised at all times whilst feeding. This product is intended for supplemental feeding only. Ingredients: Wheat Flour, Vegetable Oil, Corn Starch, Salt, Apple & Cranberry Powder, Blueberry Powder, Ascorbyl Palmitate, Multifruit Flavour, Colouring, Rosemary Extract, Vitamin E (all rac-a-tocopherol-acetate), Vitamin A, Vitamin D3.